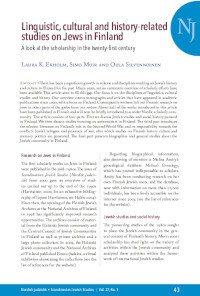 There has been a significant growth in volume and disciplines working on Jewish history and culture in Finland for the past fifteen years, yet no systematic overview of scholarly efforts have been available. This article aims to fill this gap. Our focus is on the disciplines of linguistics, cultural studies and history. Our overview covers monographs and articles that have appeared in academic publications since 2000, with a focus on Finland. Consequently we have left out Finnish research on Jews in other parts of the globe from our review. About half of the works introduced in this article have been published in Finnish and will now be briefly introduced to a wider Nordic scholarly community. The article consists of four parts. First we discuss Jewish studies and social history pursued in Finland. We then discuss studies focusing on antisemitism in Finland. The third part introduces the relevant literature on Finland’s role in the Second World War and its responsibility towards the conflict’s Jewish refugees and prisoners of war, after which studies on Finnish history culture and memory politics are presented. The final part presents biographies and general studies about the Jewish community in Finland.